Trevor is the go-to for live, studio and location audio production across every genre of television, documentary, live events, music and audio post. His body of work includes the Olympic Games Opening and Closing Ceremonies (2000 – current), Commonwealth Games (2002 – current), and Sydney’s New Year’s Eve fireworks. 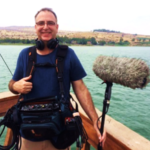 Trevor is the audio engineer for countless television series’, television commercials, feature films and documentaries for broadcasters including Channels 7, 9, 10, ABC and SBS in Australia, National Geographic, Discovery and many others around the world.